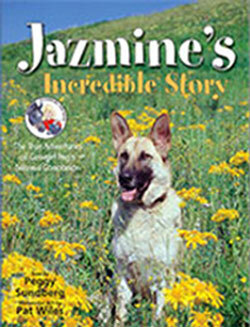 Based on the true story of Jazmine, Cowgirl Peg's German Shepherd dog, this book follows her adventures at the ranch. After her rescue from an abusive situation, Jazmine needed to learn to trust and love humans. She also had to learn how to survive on Cowgirl Peg's ranch. She learns about survival through her mistakes including encounters with a skunk, porcupine and mountain lion. She learns to trust and love people through the love and affection she receives. She grows from a shy, untrained dog into a beautiful, trained, outgoing dog that travels to schools across the U.S. with Cowgirl Peg. She is now famous for "kissing" thousands of students who love her and her story. Enjoy reading and traveling on this life journey with her. The book will be beautiful and contains a powerful message for readers of all ages. Many actual photos of Jazmine are included at the end of the book. She has visited over 100 schools nationally and kissed over 30,000 kids last year. She is on track to do it again this year! WE THANK YOU FOR YOUR ORDER AND YOUR SUPPORT! Checks and money orders can also be sent to the address om the contact page. . Jazmine will also be available at Amazon.com and Barnes & Noble as well as other retail outlets.